What about moisture in the form of water vapor? Water vapor moisture is produced both outside (humidity) and in- side (steam from cooking and cleaning). e second law of thermo- dynamics says that stuff moves from areas of greater concentration and higher energy to areas of less concentration and lower energy. With regard to vapor, air carrying the moisture (vapor) always moves from high pressure toward low pressure, and water moves from wet toward dry and from warm toward cool. When water vapor hits a cool surface, it condenses and changes from vapor to a liquid. If this is within the wall assembly, that becomes a problem, leading to mold growth and issues with rotting assemblies and poor indoor air quality. Vapor barriers (like vinyl, polyethylene or the asphalt-coated Kraft paper face of our insulation batts) can either help to prevent this from happening, or can actually contribute to the problem, depending on the climate. So you may or may not need or want a vapor barrier. The goal is to control or stop condensation. ere are two ways to do this. One is to stop the warm moist air from coming into contact with the cold surfaces. e other is to warm the surfaces so that they are too warm for condensation to occur. In the past, we primarily used the idea of stopping the moisture using vapor barriers in our wall assemblies. is is the concept behind the plastic vapor barrier covering the studs. Getting a perfect plastic vapor barrier installation is very hard and detailed work, and there have been far too many instances where small overlooked holes have caused major problems, so now there is another option. With the advent of rigid foam insulation board, we can now warm the wall surfaces to prevent condensation. And this provides the additional benefits of increasing the total insulation of the wall assembly and reducing thermal bridging. When we do use a vapor barrier, where we place it is determined by which direction the wall will dry towards. Remember, our goal is to stop the water vapor from finding a cold surface and condensing while still allowing the wall to dry in the other direction. Strange as it might seem, northern homes dry out while southern homes dry in. For example, if your home is in a very humid, cooling-dominated climate like Dallas, Texas, (or in a mixed-humid climate like in the Midwest), the direction of water vapor drive is from the warm, humid outside air toward the dry, cool air inside of the air conditioned home. As moist air comes in contact with the backside of cool conditioned wall surfaces, condensation and related problems can occur. is is especially true if the owners have kept the house at a temperature below the outdoor dew point temperature. If we had placed the vapor barrier on the inside of an exterior wall, it would have exacerbated the problem by halting the ability of the water vapor to dry to the inside. Many a builder . has removed vinyl wallpaper and found the drywall under it covered with mold and not understood the source of the excess moisture. So the right place for the well-sealed vapor barrier/vapor retarder is to the outside of the wall assembly, allowing the moisture to dry to the inside. Now, let’s consider a home in a heating-dominated climate like Minneapolis or Toronto. The warm/humid side of the house walls most of the year is the inside, and the cool/dry air is on the outside of the house. In this climate, the water vapor is driven from the inside toward the outside through the building assemblies in long winter. As this warm, humid air reaches the backside of the cold exterior sheathing, it again causes a condensation problem. e place to put the vapor barrier would be on the inside of the wall assembly. Except for extremely cold climates, we can skip the vapor barrier entirely and opt for installing the exterior foam sheathing, which keeps the wall assemblies warm enough to prevent condensation. We call this putting a coozie on your house. e thickness of the foam sheathing required depends on your climate zone. In the mild winter areas, one-half inch to one inch will do the trick. In mixed climate zones (fairly equal heating and cooling seasons), you should use an inch to an inch and one-half of rigid foam on the outside of the wall. In areas with very cold winters, you will need to install one and one-half-inch or two inches of rigid foam board to ensure that you keep the wall cavity warm enough to be trouble free. 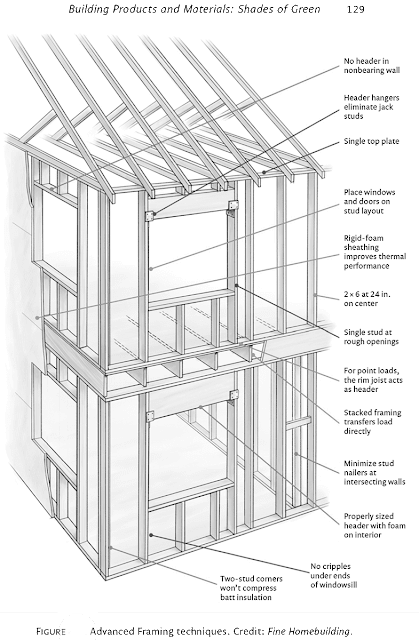 If you check with your local building code official, they can look up what is recommended in their code books. You can paint the inside wall with two coats of latex paint and that acts as an interior wall vapor retarder, slowing the rate of vapor diffusion. When combined with the exterior foam, this is an excellent system that works very well in any climate zone.36 is has been called “the perfect wall” by the building science community.37 It also works as the perfect floor when rotated ninety degrees and the perfect roof when sloped properly. It controls water vapor condensation, temperature and thermal bridging and allows drying to the inside. In the following drawings you can see the direction of water vapor ow and therefore the direction of drying that occurs in heating- versus cooling-dominated climates. e fact that the way a wall dries is not the same in all parts of our country has led to many poor decisions and confusion about where to place the vapor barrier in a new home. 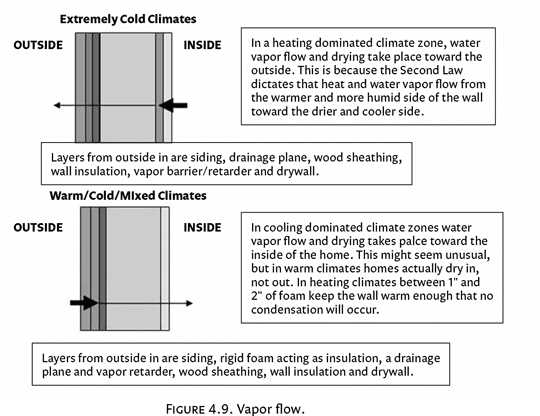 e diagrams also illustrate how the vapor barrier reduces the moisture load on the wall assembly, thus protecting it. e rule of thumb is to place the vapor barrier on the side of your wall that is more humid and warmer for the majority of the year. In hot, dry climates, walls that have no vapor barriers at all, o en called breathable walls, are a good option. Also, avoid using moisture-stopping drywall products, as are commonly used around bathtubs and showers, in areas where direct water contact is not an issue. There’s an old saying that fits this topic very well: the devil is in the details. at’s because it’s how we ash windows, doors, porches, chimneys and other key areas of the exterior walls and roof that will keep the water out of your home. 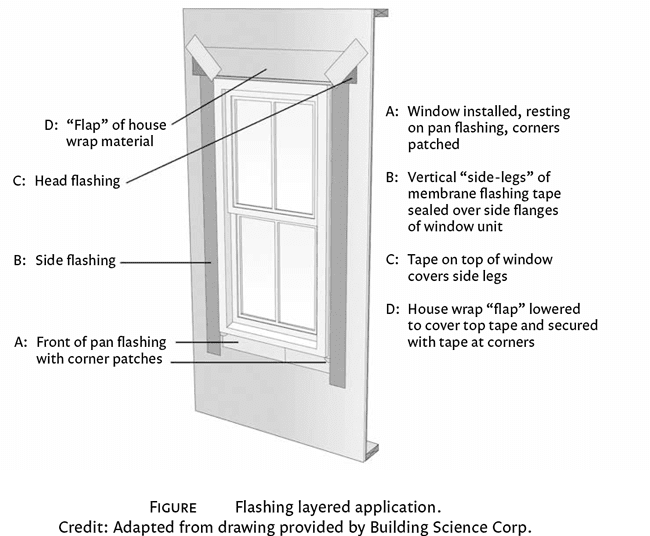 Flashings are one of the most important and overlooked components of the building envelope that make or break long-term resistance to damage. Make certain that your framers and roofers are using the right materials for the job and installing them in the proper fashion. is is not the place to cut money from your budget! Flashings of all sorts are manufactured to t every joint and intersection of your exterior building envelope, to cover all the different angles, seams, gaps and penetrations. It’s not just the materials; even more importantly, how they are installed keeps the water running downhill. With windows, the process begins with a sill pan or a layer of waterproof material covering the bottom of the rough opening that the window will be installed in. is material should be turned up at the corners at least six inches on the inside of the studs and then extend out on top of (not under) the house wrap below the open- ing. The house wrap has a wrap cut above the window. 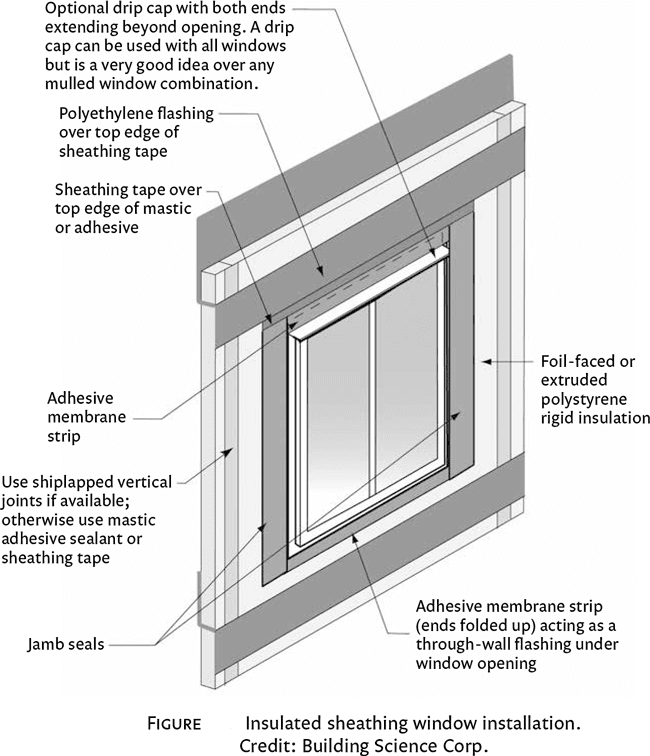 The window is then installed, and the sides are flashed with an adhesive tape, followed by a layer of flashing tape across the top of the window flange. The flap of house wrap is then brought down over the top flange, and it is taped in place with flashing tape. The bottom flange of the window is not flashed. is will allow any water that does get into the opening to drain out and ow down the waterproof drainage plane of the house and out the weep holes or screed at the bottom of the wall. By the way, the order that these flashings are installed, from the bottom up, is critical. For curved windows and doors there are flexible flashing tapes on the market now that work very well. The process for porches and decks is much the same. e drain- age plane material is fully installed before the ledger board is put in place. A er attaching the ledger board, the drainage plane is cut above the ledger board to which the joists will be attached. A ash- ing material like metal or flexible waterproofing is attached to the sheathing, and wrapped around the front of the ledger board. e drainage plane is then turned down over this flashing and taped in place. You can obtain detailed drawings showing exactly how these openings need to be flashed on the websites of the house wrap or window manufacturer for your project. The addition of an insulated sheathing to the wall assembly re- duces thermal bridging. Or you can replace the rainscreen assembly that we just described with an insulated sheathing panel system that is taped at all seams (with a 50-year warranty). These types of water management systems are always employed behind masonry or stucco walls (because water penetrates those materials so rapidly) and behind wood walls, too, in rainy or marine climates. A radiant barrier is the foil-faced roof decking (with the foil facing the attic side) that stops radiant heat gain through a vented roof assembly in hot climates. is is usually one of the first upgrades for existing construction if your roof design allows good access for installation, along with improving the insulation in the attic if needed. Note that radiant barriers require an open, ventilated air space on the side facing the house, so they should not be installed in a sealed attic, as they simply don’t work when foam insulation is in contact with them. If you live in a cooling-dominated climate, you should also strongly consider using aluminum foil faced radiant barrier roof decking material with an emissivity of 0.05 or less26 to keep your attic cooler in the summer. is will at least prevent much of the radiant heat gain through the roof assembly. is results in helping to take some of the heat load o your air conditioner and ducts during hot weather. Ice dams are a source of tens of millions of dollars in home damages each year. Homeowners have tried heat tapes at the edge of the roof, rakes, more ventilation in the attic and a million other ideas to stop this threat, but with limited success. e build- ing science community has been able to determine how and why ice dams occur, and this has led to a successful strategy to stop them. They found that the problem isn’t at the eave—that’s just where it becomes evident and does its damage. e ice dam itself is just a symptom of the real problem. Preventing ice dams is all about creating an effective air and insulation barrier at the ceiling of the house. An ice dam starts when heat is allowed to rise from the ceiling of the house at what building science calls thermal bypasses (explained below) and melts the underside of the snow pack on the roof. is meltwater runs down the warm roof as liquid at just above freezing. It stays liquid until it reaches the exposed eaves of the house, and there the temperature of the roof deck suddenly drops because the deck is fully exposed on the bottom side to the cold outside air. e meltwater ash freezes at the eave, and the ice dam begins to form. As more water melts and runs down the roof, it builds up a small lake behind the ice dam and backs up under the shingles to run down the walls of the home. If the snow pack stays frozen, there can be no ice dam. e solution is to correct the cause, not to deal with the ice dam itself. In other words, stop the heat from rising at the ceiling of the house and the snow pack will stay frozen and no ice dam will be able to form in the first place. This requires us to seal all thermal bypasses and insulation defects in the ceiling of the home. A thermal bypass is a place where the insulation and ceiling air barrier have holes in one or both system (remember: “continuous and contiguous”). These are places like open utility chases for plumbing, wiring and ducts, dropped ceilings and other irregularities that provide opportunities for breaks in the drywall air barrier and insulation at the ceiling. These openings will act as a chimney for warm air to escape into the attic where they rise and warm the roof deck. All thermal bypasses must be sealed airtight with rigid materials like plywood or foam board, then air sealed with caulk or foam sealant and then covered thoroughly with insulation. 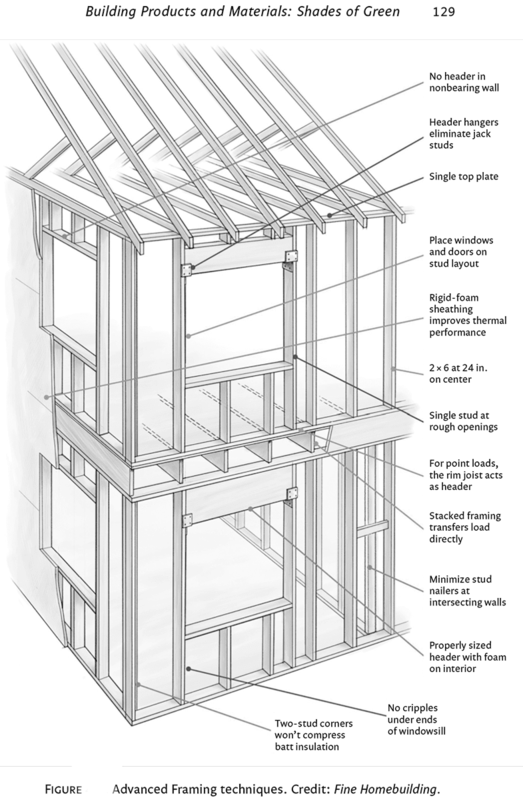 is is a job best done by the framing crew during the initial framing of the home. Subcontractors who later penetrate these air barriers must be held responsible for resealing them once they have installed the plumbing, wires or ductwork that runs through them. Any areas of missing insulation must be fully insulated. star Certified Homes Program has an excellent list called theermal Bypass Checklist24 showing everything that must be sealed for a home to be certified. The best solution in new construction is to seal everything on thermal Bypass Checklist and to use only recessed light fixtures that are airtight rated and also rated for insulation coverage. These lights are o en called AT/IC-rated recessed fixtures. They should meet ASTM E-28325 and be labeled as such. If you can’t replace the old leaky can lights in your existing home, consider a code-approved option. Build a sealed box out of drywall that leaves a clearance around the fixture as specified by the manufacturer. Cover the cans with the drywall boxes and seal the boxes down to the ceiling drywall. is will stop the air from rising through the cans and heating the roof deck and starting the process that leads to ice dams. “ Thermal barrier” is a fancy term for insulation. In a high-performance home, insulation should be installed on all exterior surfaces in an unbroken sequence. Any gaps, voids or breaks in the insulation coverage of the entire building assembly can result in heat loss or gain. is is shown in the image below with the use of a thermal imaging camera. In a color photo, heat loss shows up as warm yellow or orange and cool well-insulated areas are blue or black. 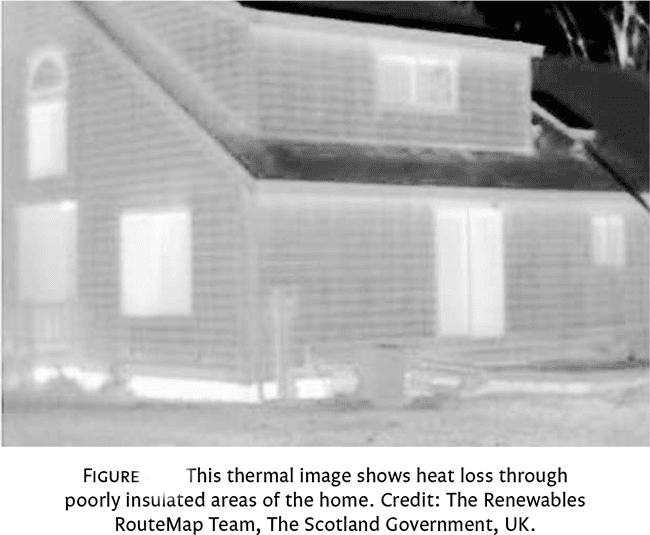 In this black-and-white rendition, light and bright areas indicate heat loss. Thermal bridging is the rapid transfer of heat through a build- ing component when that component has less thermal resistance (R-value) than materials surrounding it. Framing materials o er a good example of thermal bridging through the building envelope. Wood has an R-value of a little less than one per inch, so a typical 2 × 4 stud has an R-value of around 3.5. Compared to the surround- ing insulated wall cavities, if perfectly installed to manufacturers’ specifications to achieve R-13 or R-19, that’s quite a difference. So, if you look closely at the image above, the thermal movement through the wood-framing members allows you to see all of the studs and even the roof rafters glowing with the heat they are losing. Thermal bridging can greatly reduce the effective insulation value of a wall, floor or ceiling. Another place where poorly insulated wood is typically used is for structural headers to displace the vertical loads over windows and doors, as was mentioned previously. is volume of uninsulated wood creates large areas of thermal bridging, significantly reducing the overall thermal performance of the entire wall assembly. As was mentioned earlier, it’s unfortunate that many framing crews are taught to install headers over every window and door, even when they are located in non-load-bearing walls. is usually hap- pens due to a lack of framing detail provided to them by the structural engineer or truss designer. Best practices are to install headers only where they are required structurally, to size them only for the actual load they are to carry and to insulate them. Many insulated structural header products are available on the market, or you can make your own by sandwiching a rigid foam board panel between two layers of wood (or structural wood product) to create a thermal break. choose to use an alternative building system, like SIPs, ICFs, AAC block or a natural material, which could significantly reduce thermal bridging in the building assemblies. We recommended raised heel or energy truss de- sign as a remedy for insulation gaps between the top of the wall assembly and the edge of the roof assembly. It is evident from Figure that this home suffers from poor insulation in the so t area, a significant source of heat loss in the winter. These are like holes in the thermal envelope, and so the walls perform as if someone has left a window or door open, putting additional strain on the air conditioner or heater as it attempts to provide comfort under these conditions. Finally, note the heat loss through the foundation or basement perimeter. is has become a more important issue as we built tighter thermal envelopes, which should enable us to reduce the size of air conditioning and heating systems required to keep them comfortable. However, this heat loss through the foundation assembly can result in raising the heating loads, negating any savings achieved in the main building assembly. In fact, we have seen in- stances in the last couple of years where heat pump system sizing is being determined by these heat losses, driving up heating loads even in cooling-dominated climates with very mild winters. is means that although we did a good job reducing the cooling loads through building science and envelope improvements, we were forced to install a larger HVAC heat pump system to handle the heat loss through the foundation in the few very cold days of winter that occur. is is the best argument for insulated slabs in any location that has any chilly winter days. An insulated slab or basement can reduce the heating load on the home by as much as 25 percent or more depending on your climate and house plan.